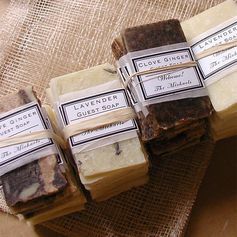 Have you visited a soap store or other boutique gift shop and seen how simple and creative the packaging is? Soap packaging is interesting because it does so much that other types of packaging don’t. It is one of the few consumer retail products that can remain exposed, and for good reason. There’s the fragrance, texture, and colour that grabs shoppers attention. Here’s a product that appeals to the entrepreneur with so many creative ways to package and market it. There’s little doubt the lessons they learn from marketing natural or organic soaps will help them greatly when they explore other products to produce and package. Soap is the product, however it is the packaging that sells, and as you can see from this lengthy list of soaps below, packaging designers are getting creative in papers, cardboard, and print designs. From retro to ultrachic, there’s a packaging style that will appeal to sophisticated soap buyers. And they expect it. Boutique, hand-crafted soap is a growing market in Canada, US, and across the globe. It’s a niche product that has universal appeal and strong sales potential if the right marketable product is created. There are products on the market doing well (Rocky Mountain Soap, and Dolce Mia Soap) and they have their own unique ingredients and packaging. Consumers are becoming more aware of the potential health benefits of different types of soaps and enriched, natural soap ingredients. Women’s cosmetic products in particular are undergoing a revolutionary avoidance of chemical ingredients, driven by the hype about the causes and prevention of cancer and aging. The push to natural soap is on. Major soap producers find it difficult to cater to the specialized soap market – it’s just too diverse in branding, ingredients, and packaging. It’s a market that creative, innovative, and strategic businesses can excel in if they can scale up production and sales appropriately. Building multiple brands is the way to way to go since consumers are particular about what they want in a soap. Hand crafted soap has gone from cottage industry to big business and it’s a favourite business startup idea for thousands of entrepreneurs. Barriers to entry aren’t as significant as you’ll find in many industries. What may limit many soap entrepreneurs is imagination and market research. Packaging is Branding. Packaging strategy and design are critical to sales success and these soaps must have packaging that projects the right visual and fragrant features and messaging. Even when selling online, the soap’s packaging is very important, since the online shopper can’t smell them. Some manufacturer’s send out small samples to encourage trial, a tactic that works. Which of these Soap Packaging styles has the Makings of a Market Winner? Pinned byLuda Konshin | OntoFashion! That’s a good look at some very unique soap products and the packaging styles these soap entrepreneurs are using today. Paper, cardboard and celephane. Very simple solutions. How’s your point of sale campaign going? If your POP displays are performing poorly, there may be good reason why. Check out our Point of sale display tips, how to improve brand exposure, and find out why its important to be disruptive and innovative at point of sale. Do POP price discount strategies lead to a slow death for your brand? Soap marketing is finding sustainable earth friendly packaging adds value. Research shows that consumers like sustainable packaging. Retail studies show POP promotion works, so why aren’t you using it more? Are you a Mississauga or Toronto-based manufacturer? Ravenshoe Packaging is close by in Markham. Check us out: Toronto packaging company.